NES Nobunaga's Ambition (USA) in 12:06.37 by CogneatoSwitch. 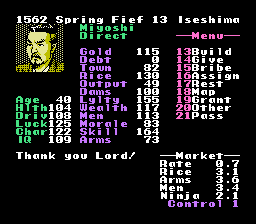 Nobunaga's Ambition (信長の野望) is a turn-based strategy role-playing simulation video game. One of the first games in its genre, it was first released in March 1983 by the Japanese video game developer Koei. Here CogneatoSwitch strategizes and luck manipulates around many obstacles, beating an hours long game in 12 minutes. Downloadable encodes have the author's commentary as soft subtitles.